Ask any Indian woman on DIY skincare and she’ll have tip or two to share. Most of these home remedies have been passed down through generations and are greatly valued even today. Needless to say I am the hugest fan of DIY Indian skincare. It is a complete skincare regime. It suits me perfectly (since I am too lazy to visit parlours). It aligns with my frugal living ideas and not to mention the wonders it has done for my skin. 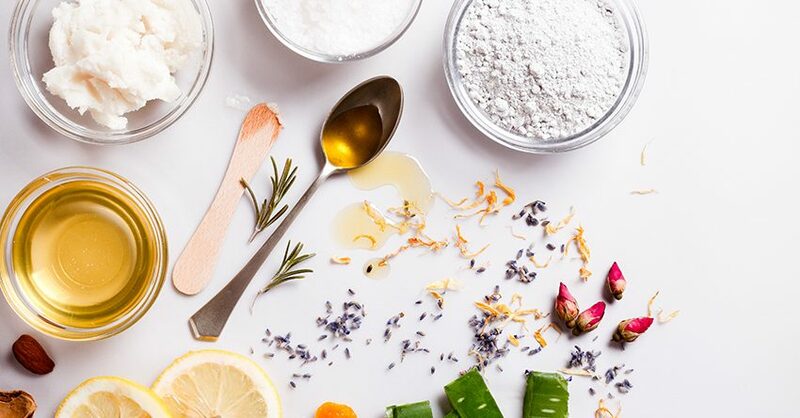 In fact I have always heard mothers, aunts and grandmothers saying the secret to a healthy skin lies in their kitchen and not in countless beauty products available today. Most of these home remedies are largely influenced by Ayurveda, an ancient branch of Indian science on health and general well-being. I am sharing some of my favourite skincare tips involving 11 natural ingredients, most of which are easily available in the pantry. Disclaimer: All skincare tips mentioned here are home remedies using natural ingredients. Most of these are considered to be very safe still not all skin types are same. Before using these tips kindly do a patch test. Turmeric: My most favourite ingredient has to be turmeric. It is common to every Indian household. A pinch of turmeric gives a yellow tinge and enhances flavour of any dish. Besides flavouring, turmeric also has a number of health benefits. It is full of anti-oxidants; it is anti-bacterial, anti-cancer and anti-inflammatory as well. Healing properties of turmeric are derived from curcumin, a chemical component present in the spice. DIY face pack and scrub: Using turmeric paste on skin is known to reduce dullness, fight acne, dark spots and wrinkles. For best results, use this face pack once every 5 days. Use it regularly and see the difference. 1 Just take a pinch of turmeric and mix it with a tablespoon of either – yoghurt and rosewater. Apply it on your face and neck area. Massage for about 15-20 minutes in slow circular motions before washing off. 2 You can even convert this face pack into natural face scrub by mixing a 2 teaspoons gram-flour into this mixture. Just like the face pack apply this face scrub on your face and neck area in and massage in slow circular motions for 15-20 minutes before washing off. Pro-Tip: Right after washing off the mixture if you can take a warm water steam on your face then nothing like it, your pores will open, absorb moisture and provide suppleness to your skin. However don’t use steaming every time you apply this pack once a month is enough. Sandalwood: Sandalwood is one of the best natural ingredients you can use on your skin during summer, especially you live in hot tropical climate like I do. It has natural healing and cooling properties so it is effective against any skin rashes and allergies. Sandalwood has a lovely smell and is mostly used in religious ceremonies in India. Due to its fragrance is also used extensively in cosmetics products. It is antiseptic too and is known to heal cuts and wounds. Sandalwood oil: Among all essential oils, sandalwood oil is a little underrated, it is not used as much and 100% pure sandalwood oil is not easily available. Sandalwood oil is a natural stress reliever and used for calming the mind. However if you don’t want to use the oil you can use sandalwood powder on your face, which unlike the oil is easily available. DIY face pack: This face pack calms down your skin and reduces any stress your skin may be experiencing. Mix 2 tablespoons of sandalwood powder with either honey or milk; all the three ingredients can be mixed together as well just see to it the mixture doesn’t end up being too runny. Now add this generously to your face and neck area and keep it until dry, which should be within 20 minutes. Wash your face gently but thoroughly in circular motions. You will notice a difference immediately. This pack can be used once two weeks or once a month. It will clear up your skin and all the dirt accumulated. Anti-Tan: If your skin is prone to tanning apply sandalwood paste to the affected area and leave it for about 20 minutes. Sandalwood is very effective is removing tan. Fuller’s Earth (Multani Mitti): Multani mitti or Fuller’s Earth as it is known in India, is perfect face pack for teenagers hitting puberty and suffering regular break-outs in skin due to hormonal fluctuations. But even if you are not a teenager you can apply this in your face regularly. Fuller’s Earth deeply cleans your pores; removes accumulated dirt prevents and removes dark circles, pigmentation, pimples and dullness of skin. Due to this fuller’s earth is considered a very effective skin cleanser for people with oily skin. DIY Face Pack: Mix a tablespoon of fuller’s earth with rose water or honey and leave the face pack on for about 20 minutes and see the difference after washing your face. You can use this once or maximum twice a month for best results. Neem: Neem tree is common herbal plant in South Asia. Neem leaves are extensively used in natural skin and hair care routine in India. The complete goodness of neem leaves are would require a new post altogether. Neem leaves are anti-becterial, anti-fungal and antiseptic. 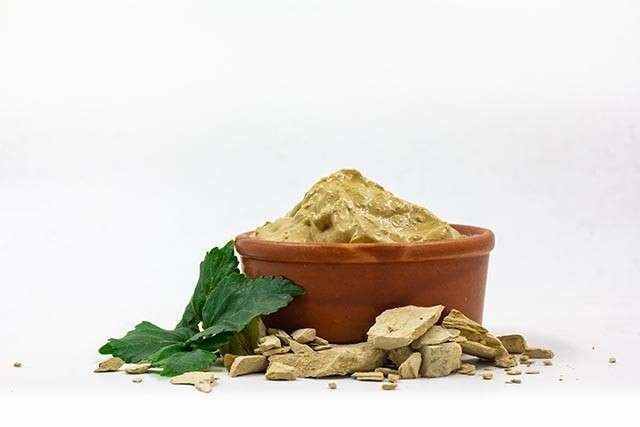 Neem paste can be safely applied to treat allergies, skin rashes, acne and wounds. Consumption of neem leaves is known to cure ulcers and prevent cancer, keep hypertension and sugar levels normal. For Hair: Perhaps the best use of neem leaves is in maintaining a healthy scalp by keeping dandruff at bay. You can boil neem leaves strain the water in a bowl and let it cool. When you wash your hair with shampoo, use this water as last rinse after you have conditioned and washed your hair. Even if you haven’t shampooed your hair you can still use this water to wash your hair and scalp. Face Mask: Make a paste of neem leaves you can use this paste directly on your skin or mix it with either honey or turmeric. Wash your face and then apply this paste, keep it for 20 minutes at the most. This particular face pack is good for those who have frequent outbreaks on skin like boils, pimples or blackheads. You can apply this paste directly on the affected area until it heals. 1 Neem paste and water are both effective to soothe skin irritation in case of insect bites. 2 Neem oil can be used to cure tooth ache and ear infections. 3 Neem water is really good for flowering plants too. I have seen my mother using neem water on her flowering plants regularly. Aloe Vera: Aloe Vera is another common ingredient in Indian skincare routine. In fact Aloe Vera is widely used in everywhere across the world in treating various skin problems. Known as skin elixir, Aloe Vera is rich in anti-oxidants like vitamin C, E and beta carotene. This rich chemical composition makes the plant a kind of one-stop solution for skin problems. Also this plant is surprisingly easy to grow at home, since it belongs to the cactus family, it doesn’t require regular watering. But keep it away from direct sunlight. 1 It is a natural moisturiser, perfect for oily skin, blends into the skin without leaving any greasy trace. 2 Being rich in Vitamin E aloe vera has anti-aging properties and maintains skin suppleness and elasticity. 3 Aloe Vera is perfectly safe to consume also, it improves your digestion. 4 It heals and soothes your skin, cures any skin damage caused by sun burn, pigmentation, eczema. 5 It also heals dark spots and stretch marks. Aloe Vera gel is perfectly safe to store in a refrigerator for upto a month. You can store it into ice-cubes by blending the gel with honey or lemon, or just in its purest form without any addition. Coconut oil: Coconut oil is widely used in cooking as well as for skincare purposes in India. It isrich in fatty acids and naturally hydrates skin and hair. I prefer to use coconut oil for my hair woes; I have curly hair that gets really frizzy at times. Regular use has certainly reduced the frizziness. Here are some additional uses. 1 Coconut oil is best for those with dry skin, it can be used during harsh winter days to prevent dry lips, knees and elbows and cracked heels. 2 Coconut oil mixed with lemon and fine sugar granules make an excellent lip scrub. 3 Coconut oil is also a good make-up remover. Just dab some oil in cotton ball and remove your eye and face make-up with one swipe, your make-up will be wiped away without any traces. 4 Hot oil massage on your scalp improves blood circulation and promotes hair growth. It also hydrates and moisturises your skin. But please note that coconut oil has a high comedogenic factor which means it can easily clog your pores if you have oily skin. Same goes for those who have oily scalp and suffer from severe dandruff problem. Use coconut oil only if your dermatologist or a skin expert recommends it. Rose Water: Another common staple in DIY Indian skincare is rose water.What I love most about rose water is its flexibility. It can be mixed with other ingredients easily and it suits all skin types. These are some of ways you can incorporate rose water into your skincare routine. 1 Rose water is a natural cleanser and toner. It cleans your skin of dirt, oils and provides hydration. By cleaning thoroughly it restores your skin’s normal pH balance. 2 Rose water fragrance is known to be effective in reducing stress and mood swings. 3 Rose water works well for puffy face and tired eyes. It is naturally soothing and takes tiredness away from your face leaving you refreshed. Mixed with sandalwood it is rosewater becomes excellent concoction for acne or other skin issues. How to make rose water: Please note this is the boiling method through which you can make your own rose water. You can learn about the distillation method here. Take 2-3 roses, gently remove the petals. Then take a bowl and heat up 2-3 cups of water. When water starts to simmer pour petals into it. Remove bowl from flame as soon as colour starts to fade from the petals. When this water cools down pour it into a jar. You can refrigerate this rose water and use it for 2-3 weeks. 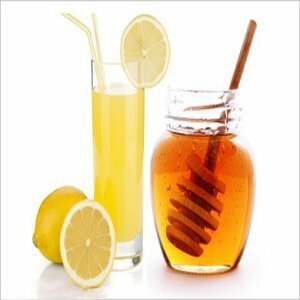 Lemon and Honey: I have always used these two ingredients together. Lemon is rich in Vitamin C and B while honey has nutrients like Potassium, Zinc, Vitamin B-6 and Copper. Combination of both these ingredients can freshen up your tired skin. Honey moisturises and hydrates your skin while lemon, being antiseptic and a natural bleaching agent cleans it effectively by removing black and white heads, flaky skin and fine lines. Face Pack: Take one 2 teaspoons of lemon juice with a tablespoon of honey. For me, this ratio gives perfect balance of an excellent face pack. Keep this for about 15 minutes. Using this once or twice a month is more than enough. If you want to use the lemon-honey combination for face scrub just add some fine sugar granules to this mixture. My DIY skincare would be incomplete without mentioning these three additional ingredients. These 3 ingredients are my quick-fixes and can provide results immediately after application. Cucumber: If you have dark circles cucumber is the best solution for your tired eyes. Just cut two slices of cucumber and let that rest over your closed eyes. Cucumber has almost 94% water and naturally clams down your skin stress and other irritations. Tomatoes: Tomato is a natural bleaching agent, it is rich in Vitamin C and K. Applying tomato slices to your skin clears your face instantly and gives it a glow. Potato: If your skin is prone to sunburn, potato may provide your skin with instant relief. Not many may agree with this method but this works the best for my tanned skin. Face Pack: Cut two potato slices and keep those in the fridge in case you have to go outdoors on a particularly hot day. After coming back home wash your face and apply those two slices thoroughly but gently on affected areas and wash your face after 15 minutes. Your tanning will reduce visibly. This method works for me every time. Two misconceptions commonly heard about home remedies are too much hassle and time-consuming. The DIY skincare packs mentioned here are very simple to make and maximum application time is of 20 minutes. Also since it is not always possible to visit beauty salons at the drop of a hat, these cost-effective, completely natural home remedies will come to your rescue and resort your skin’s health. I hope you found this post useful. These are just some of the ingredients common in every Indian kitchen as well as to DIY Indian skincare. If you want more such tips do let me know. Do you like natural and home remedies when it comes to skincare? Or do you have some tips to share? Please share. Always happy to know your thoughts! Lovely post. I loved how well you have given details of how and why to use. I love using kitchen ingredients in my skin care regime. Natural, free from chemicals, easy to prepare and cost-effective.